Doucce Freematic Blush in #49 Zen Orange – The time to try peach is now. We’re obsessed with this universally flattering coral shade that leaves a smooth matte finish on our cheeks. Orange you glad you tried it? Buildable and blendable. We swear this is a coral that nobody can mess up. Soft, silky powder glides on evenly every time.Goes the distance. Oil-free formula won’t fade or smudge throughout the day. I like this blush. It is a smooth, creamy formula that blends well. It is nicely pigmented and works well with my light skin tone. It is a peachy shade and doesn’t look orange at all. It lasted all day and has a satiny finish. NUXE Nuxellence Detox – This silky-smooth serum purifies and detoxes. After a few uses, our skin looked luminous and well-rested—even after an all-nighter.Stimulates circulation in our skin and leaves us with a lasting glow. Quick fix. Fast-absorbing formula never feels oily. Works for all skin types and all ages. I love trying new serums so I am super excited about getting this. I am finishing up a serum right now so I won’t use this for a few more weeks. Absolute New York Matte Stick in NFA52 Dark Red – Miss Scarlett. In the study. With the lipstick. But the real mystery is how this stunning red shade gives a perfect matte finish that goes on creamy and won’t make lips look or feel dry.No separate lip liner needed. Won’t bleed or run. Made to stick. Lasts until we decide to take it off. The perfect accessory. Deep ruby color goes just as well with jeans or a ballgown. 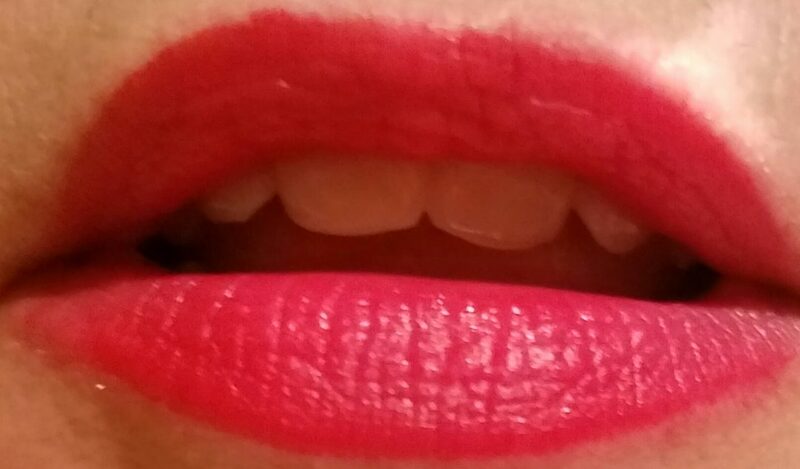 I always like to try new lipstick formulas and shades. For me, red is not an everyday color but it will be good to have for the holidays. It is a well-formulated matte lipstick. It is creamy and opaque and glides on well. It is a bright, vibrant red that has decent staying power. It does transfer and won’t stay put through eating. It stayed creamy feeling and was not at all drying. theBalm Cosmetics Mad Lash Mascara – So flexible, we think it’s been doing yoga. One of the most bendy wands we’ve ever laid eyes on, it moves easily to hug each and every lash.Curved brush gives uber volume and lift. The tip of the wand is ideally designed to get at even the tiniest of lashes. Into the deep. Rich black shade brings out our dramatic side. It will take me a while to get around to trying this as I am using another mascara right now. I only have 1 tube of mascara open at a time to keep it from drying out. OFRA Cosmetics Banana Powder – The minute we discovered banana powder, we knew it was a monkey do. We can’t believe how versatile this product is: concealing, highlighting, setting, and more. Tone it down. Yellow color corrects any redness on our faces. Made-to-fit. Suits any skin tone—from light and fair to dark and deep. Light banana scent has us craving cream pie. This is the item I am least excited about in this bag. I already have this from some prior subscription bag/box. I have used it to set my undereye concealer and to set my makeup and there is nothing special that I see. I will pass this one on to someone and see if they like it better than I do. This was a pretty good bag this month. I like the blush a lot and the lipstick will look great at holiday events. I am looking forward to trying both the serum and the mascara. Especially the serum. I love a good serum. The only item that disappointed me was the banana powder and that is also because I already have it. Do you subscribe to Ipsy? What did you get in your bag this month? Were you happy with it? If you enjoyed this post please “like” it and follow me to make sure you don’t miss any posts. Thanks so much for stopping by. I used to have Sephora Play but wasn’t impressed. I usually like my Birchbox which is the same cost as Ipsy. It tends to have more skincare products. My favorite, though, is Boxycharm. It is $21 per month but usually worth every penny. I will post about the November box next Monday. It was pretty sweet! Cool! I got Boxycharm once, and wasn’t impressed. I have to check out Birchbox as I’ve heard so many good things about it. Thanks!